I'm excited to be a part of the Memorial Day Bloghop for Operation Write Home. Here is the tutorial for the card which will be posted tomorrow. The card has a flower with a mat. To make the flower and mat, I used the Bigz L Die 121812 Fun Flowers. 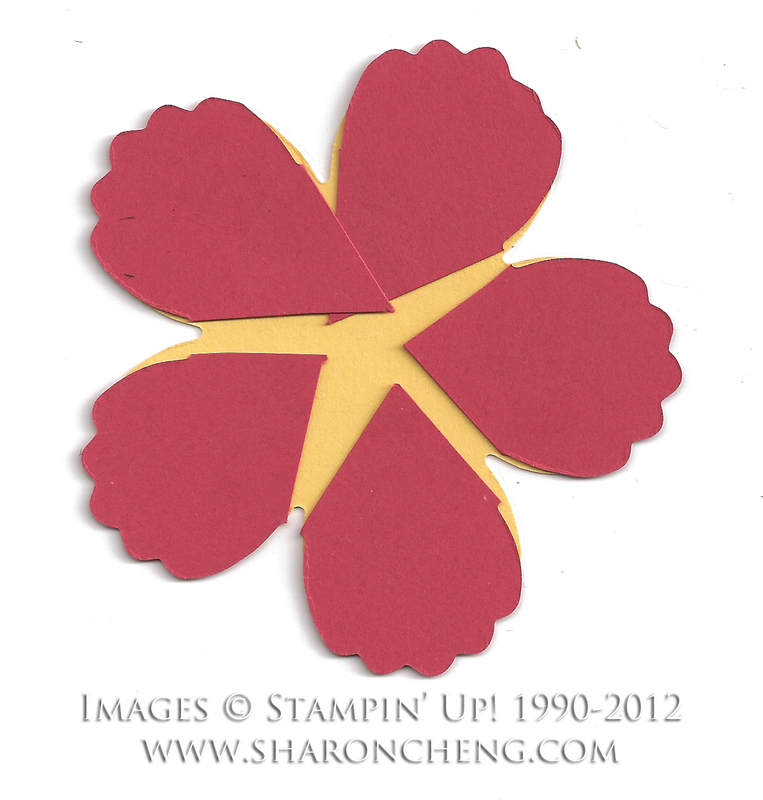 For the mat, I cut the flower into 5 petals and attached them to the back of the flower. The flower in tomorrow's post looks much better from the front! For the leaves, I used the 121808 Blossom Petals Builder Punch. 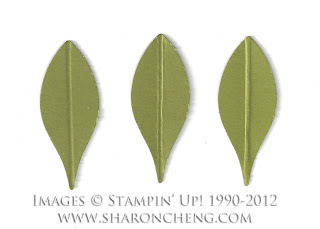 Each leaf takes three quick steps to make the center vein really stand out. 1. Score the leaf down the middle. 2. Fold the leaf along the score mark. 3. Turn the leaf over and fold in the opposite direction. That extra fold really makes the vein pop! For a free catalog, place a $50 order through my online store and I'll mail you a free catalog. Or pay $5 for the shipping and I'll mail the catalog to you! E-mail me at sharon@sharoncheng.com to send me your address. 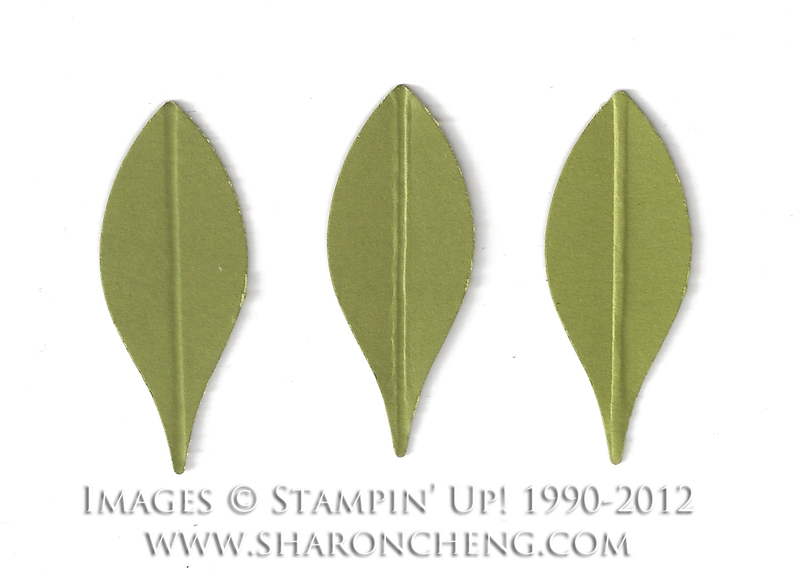 Stampin' Supplies for the card in my 5/26/2012 post. Thanks for a change on the goodies! Your card is totally gorgeous! Pat K.
As I said on the bloghop post, that's a beautiful use of one of my favorite sketches! Thanks for the instructions, and the chance to win goodies! Thanks for the tutorial! This is fantastic. I agree with Yolanda... thanks for the tutorial and the chance to win goodies. Beautiful work with the flower...striking. TFS and the great offer. Thanks for the hints on how to make that flower pop! Thanks for sharing how you made this gorgeous flower.